While there are dozens upon dozens of patents that Apple has been granted, very few reach the quirkiness of the patent that Apple was granted today. The patent handed out day is that of a handheld device (think: future iPods, iPads and iPhones) that use capacitive, resistive touchscreens as as well surface acoustic wave forms (wth?) to recognize your hands/fingers simply by the way you hold it. After recognizing, the device may then automatically switch to your previously-personalized settings. These sensors also allow for the entire device to become a sort of a control. 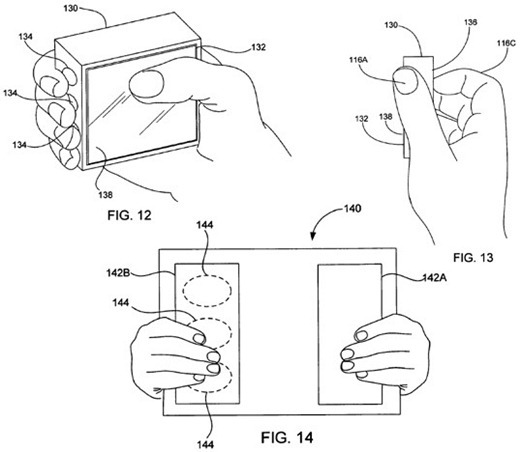 What this means is that comfortable one-hand operation may just become a reality since you can hold the device in one hand and your fingers can generate button zones right on the gadget’s body!